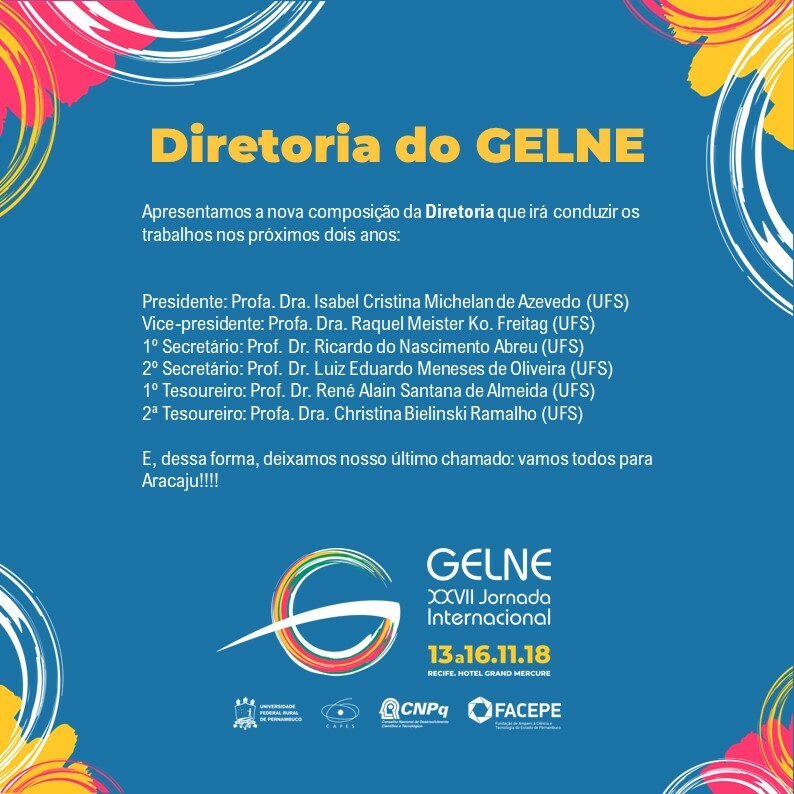 GELNE has to the present time promoted twenty-six Journey of Linguistic Studies in several cities in the North-East: João Pessoa (PB), Campina Grande (PB), Cajazeiras (PB), Sobral (CE), Limoeiro do Norte (CE), Natal (RN), Recife (PE), Teresina (PI), Fortaleza (CE) and Salvador (BA). Professors and experts from the region have attended these events but not exclusively: researchers from different Brazilian states and from different countries (such as Argentina, Chile, Mexico and Uruguay) have also joined the activities. In 2017, when the Association celebrated its 40th anniversary, the current Board released the 40-year Journey, a celebratory and mobile project that consisted of three events promoted with partnerships between Universidade Federal Rural de Pernambuco (UFRPE), Universidade Federal de Sergipe (UFS) and UniversidadeEstadual do Sudoeste da Bahia (UESB). The events were held in Recife (14-16 June, 2017), Aracaju (07-09 December, 2017) and Vitória da Conquista (09-11 May, 2018). The Journeys held in Aracaju (SE) and Vitória da Conquista (BA) have strengthened both academic and professional MAs as well as Doctor degrees in the areas of Languages and Literature and Education offered by these universities. Quantitatively, the events received over 1,500 abstracts, 40 round-tables, 6 conferences, 400 poster presentations and published 3 books both in digital and print form. For more information check the Association website: www.gelne.com.br. During the Journeys, several goas were achieved (and must be continued) regarding the policies underlying pre-service education for language teachers and the promotion of research from post-grad courses in the region. These advances are based on the integration of higher education institutions that develop research, teaching and extension activities in the field of languages and have led the current Director Board to the announcement of the 26thJourney of the Group of Linguistic and Literary Studies in the Northeast (GELNE) in its international unfolding. The present edition will be host to guests from foreigner institutions who have been partners to universities in the Northeast in both language and literary fields. The Journey will take place in the Hotel Internacional Grand Mercure Recife, from 13th to 16th November, 2018. In addition to the Journey, the Group will also host the 5thForum for Coordinators of Postgraduate Programs through a partnership with post-grad programs focused on Linguistics and Literary studies all over Northeast. We are waiting for you!